Moments ago, Sony Music announced that it has cut ties with R. Kelly on the heels of immense public pressure and protest after the release of the Lifetime documentary Surviving R. Kelly, which detailed allegations of sexual misconduct against the singer. “It is long past time that Sony Music and RCA Records sever ties with R. Kelly. “This has been a long and harrowing battle for justice for the all the Black girls who were disbelieved and made vulnerable to R. Kelly. Sony’s decision to drop Kelly is all thanks to the survivors who spoke out, and the activists who’ve been fighting for accountability for Kelly for years, including the leaders behind the #MuteRKelly movement, Color of Change, Girls for Gender Equity and so many more. UltraViolet is proud to have worked with them. Today’s announcement is a victory for them and for the Black women who have been struggling to secure justice even amid this #MeToo reckoning. Last year, following Spotify’s decision to remove R. Kelly and other infamous abusers from its official playlists, UltraViolet penned an open letter to Spotify CEO applauding the company’s decision, but urging them to take a deeper look at other artists with a history of sexual and physical abuse that continued to profit from Spotify’s promotion. Ultimately, Spotify reversed its decision to hold abusers accountable and added R. Kelly back to official Spotify-promoted playlists. 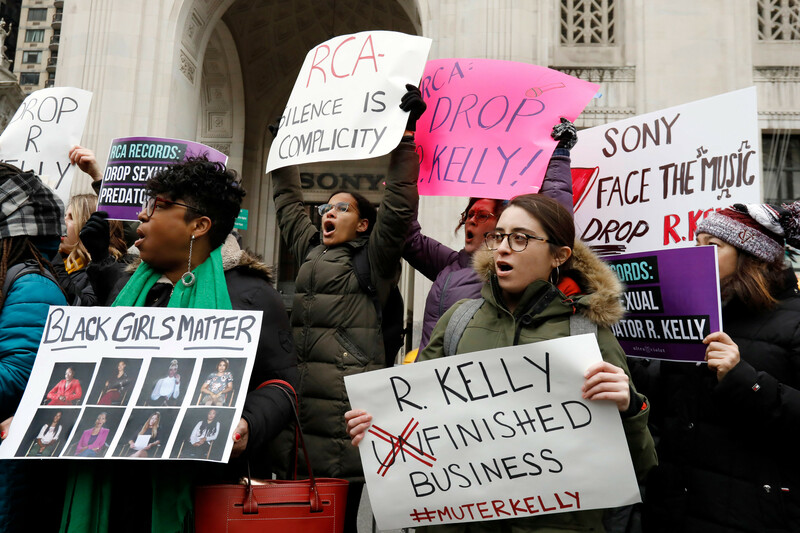 In 2019, tens of thousands of people have signed on to UltraViolet’s petition, echoing the calls of the #MuteRKelly and the #TimesUp movements, urging RCA Records to drop R. Kelly. UltraViolet commissioned a plane banner to fly over Sony Music’s HQs in Los Angeles, urging RCA Records to sever ties with R Kelly and took part in the “#MuteRKelly Rally to Protect Black Girls” at Sony Music HQ’s in New York City earlier this week.